X-Static and Total Mayhem join forces once again to bring you an unforgettable joint birthday, that can’t be missed! X-Static will be celebrating an amazing 10 years of events still talked about to this day, for many X-Static was their first ever hard house experience. Joining X-Static will be Total Mayhem who will be celebrating 7 years of successful parties doing what it does best, Total Mayhem! Bring these two colossal events together and you get one of London’s biggest birthday events to hit the scene for a long time! There was only going to be one way to celebrate this special event and that was to pull an equally monster line up. We gladly welcome and open the decks for the first time to BBC Radio’s legendary King of Trance Dave Pearce (Listen to Dave Pearce Dave Anthems Sunday nights at 8pm on BBC 6 Music http://www.bbc.co.uk/6music and http://www.davepearce.co.uk ). Plus we welcome back our favourite, The Queen of Hard House, Lisa Pin-Up! Like X-Static and Total Mayhem, both Dave Pearce and Lisa Pin-Up have played major parts in the club scene movement and both will be putting on a show you won’t forget and that really can’t be missed! If that wasn’t enough to wet your whistle, we’ve got more... Debuting in Room 2 we welcome Prohibition, a fresh new face presenting the best in Funky House and Electro. 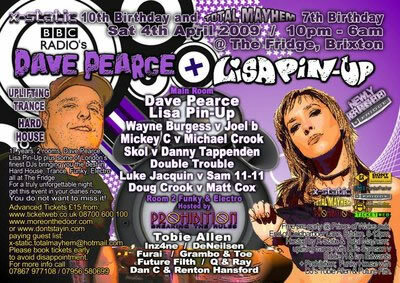 17 years, 2 rooms, Dave Pearce, Lisa Pin-Up plus some of London’s finest DJs bringing you the best in Hard House, Trance, Funky, Electro all at The Fridge. For a truly unforgettable night, get this event in your diaries now. You do not want to miss it!